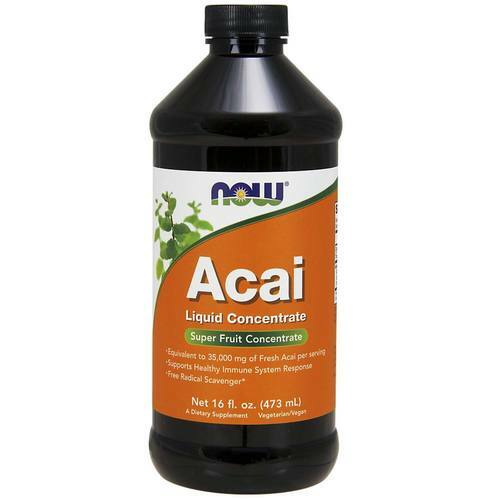 With Acai Liquid Concentrate from Now Foods, you can get the equivalent of 35,000 mg of fresh acai per serving! Advertências: For adults only. Consult physician if pregnant/nursing, taking medication, or have a medical condition. Keep out of reach of children. Notas: Not manufactured with yeast, wheat, gluten, soy, milk, egg, fish or shellfish ingredients. Produced in a GMP facility that processes other ingredients containing these allergens. Natural color variation may occur in this product. Recomendações de uso: Shake well before using. Take 1 tablespoon (15 mL) 2 to 3 times daily. Can be taken directly, or mixed with water or juice. Refrigerate after opening. As avaliações dos clientes postadas abaixo são baseadas em experiências individuais e NÃO representam necessariamente os resultados esperados ao usar/tomar Now Foods Açaí Líquido Concentrado Açaí Berry 16 onças. Esses resultados podem ser atípicos e você não deve necessariamente esperar ter os mesmos resultados. Os resultados reais podem variar.